Our first rallycross proved just how unsupportive the side bolsters of the stock Impreza seats were... Who am I kidding, we just wanted to justify some JDM bling and found some V7 STi seats at a price we couldn't resist. Problem was, the height adjuster was only found on the JDM driver's side seat (the right side) and being fairly tall we needed to move it to the USDM driver's side (the left side). For once, the Internet proved fairly useless, as the few resources I managed to locate on the issue said that this cannot be done with V7 seats. It can. 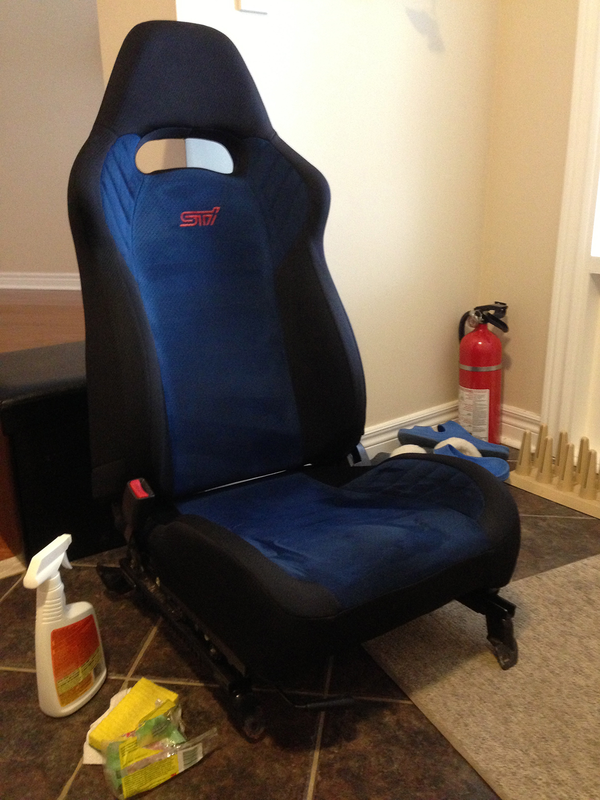 All you need is a pair of USDM donor seats (from an 02-03 Impreza or WRX) and a hammer. Well a couple other hand tools won't hurt, and if you're using base Impreza seats for a donor you'll need an angle grinder and a welder as well. Warning! If you do this modification to your car you will very likely be killed and/or badly injured. I am in no way shape or form responsible for the modifications you do to your car. If you choose to proceed with this modification be aware that it will require you to remove the seat back from the seat base. When you do, do not for any reason decide to pull the adjustment lever - the spring in the mechanism will snap shut so hard you are very likely to loose a limb or two. Seat Base: This consists of the sliders, height adjuster, and base to which the seat bottom foam attaches. It is one part that cannot be separated - everything is riveted or welded together. It also contains the seat back adjustment lever and mechanism which can be taken off, but shouldn't be. Seat Cushion: This is a piece of foam and cover that sits on top of the seat base. Seat Back: This is the seat back structure together with its foam and cover. It can be unscrewed from the seat back adjustment mechanism. The next thing to note is that if you compare the left JDM seat with the left USDM seat, you'll notice that the seat bases are completely different. The lack of a height adjuster on the JDM seat is the most obvious difference, but the other is that on the JDM seat the bottom foam is mounted on a sheet of steel, while on the USDM seat it is mounted on springs. Therefore the foam is not interchangeable between the left seats. Not to worry, the foam is interchangeable between the driver's seats, and between the passenger's seats with slight alterations. Both USDM and JDM driver's seat cushions are mounted on a spring base, while both passenger's seat cushions are mounted on a sheet metal base. Let's start by making a driver's seat with height adjustment. Start with the USDM driver's side seat base. If using a seat base from a WRX it will already have steel hoops welded to it for thigh support. If using a seat base from an Impreza the steel hoops will need to be cut off from the JDM driver's seat and welded on the USDM base. Next attach the JDM driver's side seat cushion to the UDSM base. The fabric cover will need to be trimmed on the left side to accommodate the height adjustment that is now on the opposite side, but the cushion will fit onto the base. Finally, attach the JDM passenger's side seat back to the USDM base. The USDM seat back adjuster should be kept on the base, and only the JDM seat back transferred. 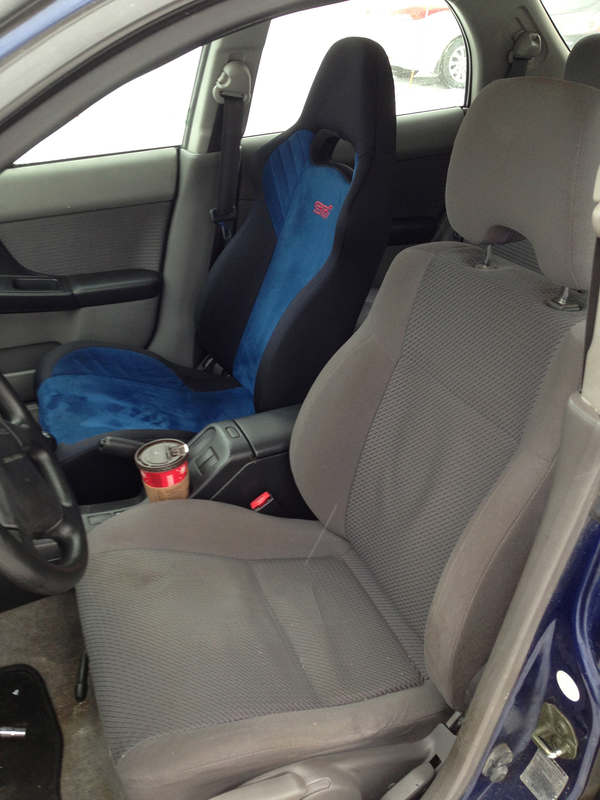 There you have it - JDM V7 STi seats in a USDM bug-eye Impreza, with the height adjustment on the USDM driver's seat. Now put the remaining parts together and sell them on eBay as a set of JDM seats from a base Impreza, asking more than you paid for the STi seats for the rarity factor. Great article! I had a pile of JDM and USDM seat parts in front of me a few months back. Your setup is the most logical for the proper swap, but I feel like I ran into problems when trying this (you start to over-think the whole swap after you have tried so many different combinations!). I finally settled on the setup below, but the driver's seat is just too high even on lowest setting. Will be correcting this tonight! Thanks! That’s an interesting plan. Getting height adjustment on the passenger side as well is definitely a plus. But as far as I remember the driver and passenger bases are quite different in the way the cushion is mounted, so it would need a lot of custom work to get the JDM passenger cushion to fit on the USDM driver base. Good luck and thanks for reading! I corrected this awhile back. You are correct, the cushions are very different. I am now using both USDM bases/sliders, swapped seat cushions and called it a day. Thanks for the article. It helped a ton! "the spring in the mechanism will snap shut so hard you are very likely to loose a limb or two." Haha. Well the warning may have been a little exaggerated. But that spring is much more powerful than you would expect. If you keep your wits and work safely, it’s a pretty straight forward and very rewarding mod. IS there anyway to get some pictures to this? I have dissembled and repaired many cars in my day but I have never worked on a seat and do not want to approach it blindly.